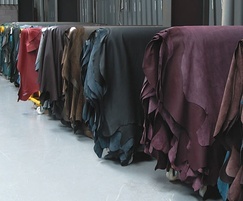 Grampian high-performance leather, available in 51 colours. Primarily developed to provide high durability, Grampian is a cost-effective, high-performance leather. It is a versatile, lightly-textured material suitable for a wide variety of applications. The Grampian range delivers high-quality leather in a vast choice of colours. Each colour in the Grampian range undergoes testing to ensure that the requirements of the target industries are met. The tanning process has been modified to add additional softness and a natural feel, while the protective finish has been enhanced. The leathers in the Grampian range are manufactured to a thickness of 1.1 to 1.3mm, are referenced by GP codes/numbers and comply with the following specifications: BS 6608 Grade SD/L, BS EN 1021, Ignition Source (crib) 5 and MED - Marine Equipment Directive.